Nationally Certified Monte Foreman Handler, Instructor, Rider, Trainer and Trainer to the Trainers! Learn the science of riding and handling horses. • Foundation for all advanced work with horses. • Gain confidence and skill in timing, feel and balance. • Learn to handle a horse at all speeds. • Applies to all disciplines & equestrian sports. • Make a happy horse. 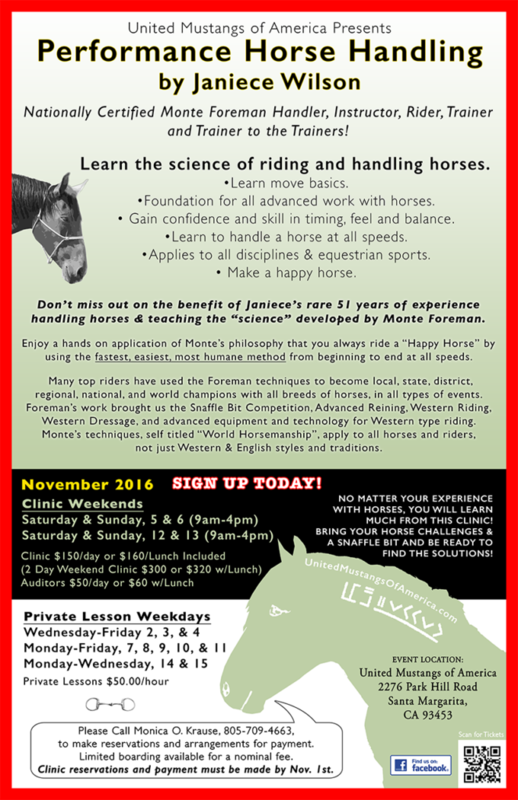 Don’t miss out on the benefit of Janiece’s rare 51 years of experience handling horses & teaching the “science” developed by Monte Foreman. Enjoy a hands on application of Monte’s philosophy that you always ride a “Happy Horse” by using the fastest, easiest, most humane method from beginning to end at all speeds. Many top riders have used the Foreman techniques to become local, state, district, regional, national, and world champions with all breeds of horses, in all types of events. Foreman’s work brought us the Snaffle Bit Competition, Advanced Reining, Western Riding, Western Dressage, and advanced equipment and technology for Western type riding. Monte’s techniques, self titled “World Horsemanship”, applies to all horses and riders, not just Western & English styles and traditions. NO MATTER YOUR EXPERIENCE WITH HORSES, YOU WILL LEARN MUCH FROM THIS CLINIC! 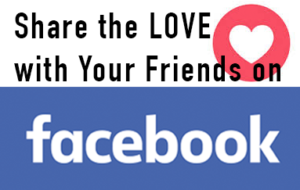 BRING YOUR HORSE CHALLENGES & A SNAFFLE BIT AND BE READY TO FIND THE SOLUTIONS! 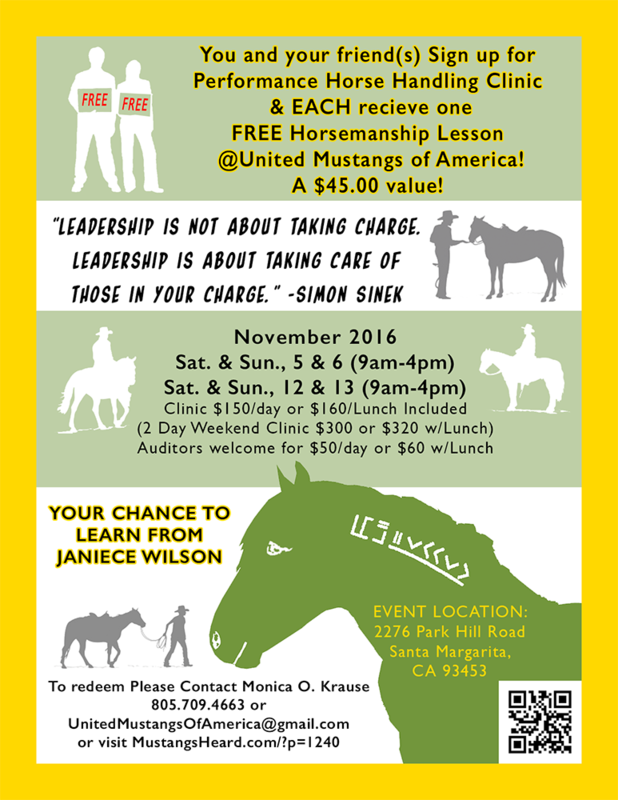 You and your friend(s) Sign up for Performance Horse Handling Clinic & EACH recieve one FREE Horsemanship Lesson @United Mustangs of America! A $45.00 value! 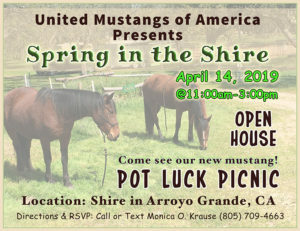 Please Call Monica O. Krause, 805-709-4663, to make reservations and arrangements for payment. Limited Boarding available for a nominal fee. Or Email UnitedMustangsOfAmerica @ Gmail.com. Reservations and payment must be made by November 1st. Note: Please bring your snaffle bit and arrive at 8:30am for preparation/tack up time.